Sightline Enterprise Data Manager™ (EDM) is a powerful IT monitoring and performance analytics solution that provides real-time visibility across today’s modern cloud, virtual and hybrid IT environments. Sightline leverages big data visualization, predictive analytics and machine learning to deliver root cause analysis, real-time anomaly detection, automated forecasting and capacity planning to help organizations identify infrastructure problems. 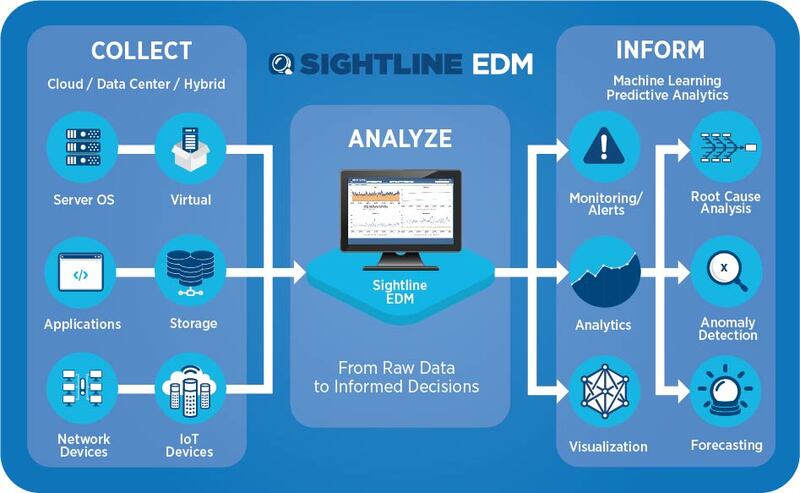 Sightline EDM collects and analyzes IT performance data to inform IT operations decisions, identify performance issues and reduce mean time to resolution. 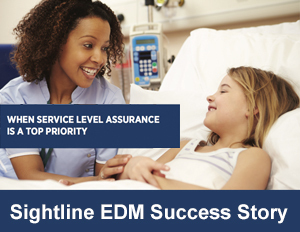 Sightline EDM proactively monitors IT infrastructure systems across to help IT teams quickly connect the dots between first alert and final outcome. Sightline EDM collects hundreds of metrics from servers, applications and network devices every second — including CPU, Memory, Disk, Network and File Systems — down to the process or thread-level. By quickly aggregating, visualizing and analyzing this time-series data, Sightline helps IT teams understand the past, present and future state of their IT infrastructure to proactively predict performance issues and prevent unplanned downtime. Many Fortune 500 and Global 2000 companies trust our big data analytics and visualization platform to identify resource bottlenecks and dramatically reduce mean time to identification and resolution. Sightline’s highly interactive, visual tools are used to establish performance thresholds, maintain service delivery levels and help customers save millions of dollars in outages and downtime by fixing underlying issues instead of just symptoms. Sightline EDM streamlines the root cause analysis process to help IT teams minimize the cost, duration and impact of expensive performance issues. 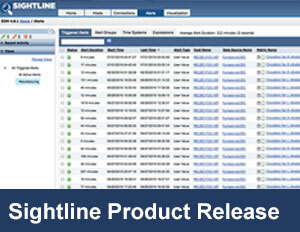 By correlating and analyzing alerts and events across all servers, applications and databases, Sightline’s powerful correlation engine allows IT teams to dramatically reduce mean time to identification and resolution of issues and avert or reduce costly downtime across your entire organization. Sightline EDM provides real-time anomaly detection to help organizations identify emerging issues before they become service disruptions. Sightline automatically identifies anomalous patterns in your operating environment based on historical performance data and proactively alerts IT Managers and System Administrators to take corrective action to minimize the cost, duration and impact of system problems that could affect customers and services. Sightline EDM automates the capacity planning process to help IT teams meet current application workloads, withstand sudden spikes in demand or support future growth. Sightline analyzes historic resource utilization to baseline existing system performance, identify resource bottlenecks and forecast capacity constraints. Sightline allows organizations to accurately predict when systems will run out of capacity days, weeks or months in advance.